In this article we are going to learn How to install Tagspaces desktop file organizer software in Ubuntu 16.04. Tagspaces is a open source best file organizer application for Linux. By using this application you can manage your data more easily by catagorize in tags. Personalize the tags by giving different colors and names which will make you more convenient to manage data. Tagspaces desktop file organizer software is an nice alternative to Evernote note taking app. Tagspaces was initially developed on year 2012 and released under AGPL (Affero General Public License) License. You can download the Source code of this application on Github to customize. It’s an cross platform application available for major operating system’s i.e. Linux, Microsoft Windows, MacOS. Tagspaces is also available for mobile devices i.e. Android and iOS. You can tag your files very easily. Tagspaces desktop file organizer software can be use as a Searching tool as it has capability to Search files from your current location. For example you can search files of your desktop. Can be extend the features of this app by installing official extensions. Sync you files with popular cloud storage’s like Dropbox. For more information’s and features of Tagspaces best file organizer app you can visit the official website. Before start the installation of Tagspaces desktop file organizer software let’s update the packages & repositories of Ubuntu 16.04 using below command. After updating the packages & repositories now we have to download the Tagspaces best file organizer from it’s official website. Hence to download the same use the below command. Connecting to www.tagspaces.org (www.tagspaces.org)|52.222.128.16|:443... connected. Connecting to github-production-release-asset-2e65be.s3.amazonaws.com (github-production-release-asset-2e65be.s3.amazonaws.com)|54.231.98.88|:443... connected. As you can see below I have already downloaded the Tagspaces desktop file organizer software .deb package. Refer the output below. Now we are ready to install the Tagspaces best file organizer package. So let’s go ahead and install the same using below command. As you can see above we have successfully installed the Tagspaces desktop file organizer software. Now to confirm the same use the below command. Now to open the application just type the command tagspaces on shell prompt. Refer the command below. You can also open the Tagspaces best file organizer application graphically using Search your computer box. Refer the snapshot below. To uninstall the application use the below command. This is how we can install Tagspaces desktop file organizer software in Ubuntu 16.04 – a best file organizer for Linux. If you found this article useful then Like us, Share this post on your preferred Social media, Subscribe our Newsletter OR if you have something to say then feel free to comment on the comment box below. 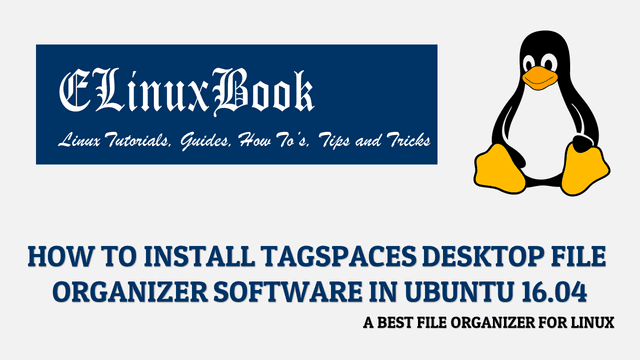 The post HOW TO INSTALL TAGSPACES DESKTOP FILE ORGANIZER SOFTWARE IN UBUNTU 16.04 – A BEST FILE ORGANIZER FOR LINUX appeared first on Elinuxbook: Linux Tutorials, Guides, Howtos, Tips and Tricks.